A traditional looking faucet that’s equipped with many modern features to make your stay in the kitchen an unforgettable experience. This is a beautiful combination of the traditional and the modern style that will fit perfectly in your kitchen especially if it made in a more classical way and interior. It fits both one and three holes and can be mounted really easy. Even though this is a traditional looking faucet, it’s made to make the user’s stay in the kitchen as pleasant as possible. Lots of features are making this is faucet a modern one, and only the look is traditional. The arc is 15.5 inches high and together with the hose that’s impressive 68 inches long, you can do absolutely anything you can think of in and around the sink. Aside from the washing, you can fill bottles outside the sink or water your plants. The hose is connected to a spray head on which controls of the water flow and stream are placed. Also, you can pause the water flow from the same place. There are two different streams – the standard and spray option that is great for cleaning the vegetables or fruits that might get damaged if the water flow is too strong. 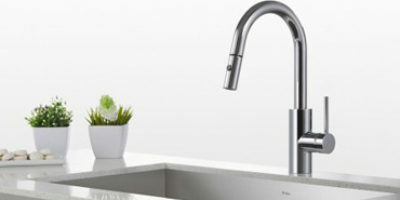 The water temperature, the power of the jet flow and the turning on are controlled from the handle placed in the middle of the main body of the faucet. However, water can be also controlled from the spray head. After using the hose, you can simply turn the water off and let the spray head go. It will connect on its own back to the spout. This is done excellent from the Moen company by the help of the Reflex system technology. A lifetime limited warranty comes with this product so you know that it is made perfect. It is really durable and will probably last for years until you decide to change it with a different model. 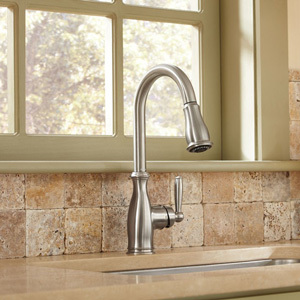 For a traditional looking interior of your kitchen, you need a traditional looking faucet. The Moen Brantford High Arc Faucet is just what you’re looking for because the design is traditional, but the features will make get the user experience on a completely new level. 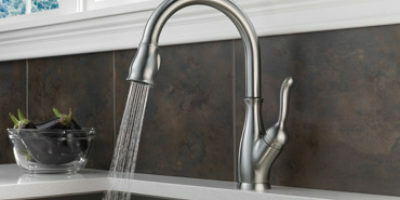 One of the best things about the Moen faucets are the stainless finishes that are simply amazing. No fingerprints, no water stains. 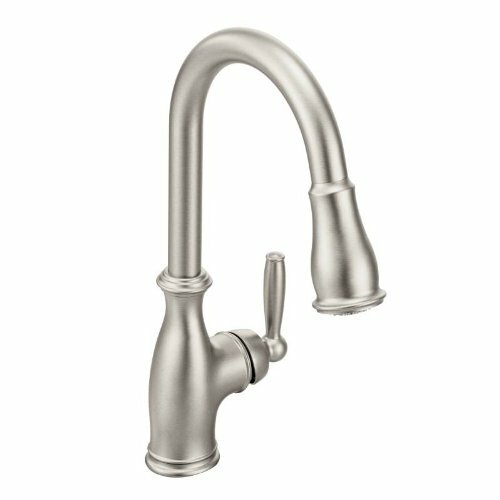 Some might not like the look of the stainless finishing, but it is really handy for people that hate cleaning the faucet all the time. There are three different finishes. The spot resist finishing that is very popular, then the chrome finishing and the oil-rubbed bronze that has the most amazing traditional look that will fit perfectly in a traditional looking kitchen. Even though this is a classic faucet, the features are what make it truly amazing. The hose and the spray head are not seen as modern because they are nicely hidden to keep the traditional look. The handle and the spout are also made with a beautiful look that looks like the kitchen faucet from another time. After using it, the Reflex system helps the docking to be easy and precise. Also, you don’t have to worry about the perfect look while mounting it. The Duralock quick connect system will help you install the faucet without a single problem. There won’t be any flaws and the look will certainly be perfect.